Preheat oven to 375°F/190°C and place a rack in the center of the oven. Roll out the dough: Take the dough out of the fridge and let it sit on the counter for a few minutes to soften slightly for easy rolling. On a floured surface, roll dough out into a 12-inch (30cm) circle, then place gently into a 9-inch pie pan; you can do this by flouring a rolling pin and rolling the dough loosely around it, then unrolling it into the pan. With a sharp knife, trim the edges of the pastry to fit the pie pan. Use a fork to create a decorative border or crimp the edges using your fingers. Cover with plastic wrap and place in the fridge for 15 minutes. Make the pumpkin Filling: In a large bowl whisk the eggs and sugar until combined. Add the pumpkin puree and whisk to combine. Add the remaining ingredients and whisk until combined and smooth. Set aside. I highly recommend bling baking the pie crust before adding the filling. 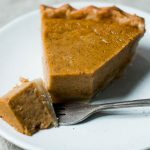 You can skip this step and proceed to the next step, but note that without baking the crust first, the crust will be more mushy than crisp and bright in color at the bottom (also if you skip this step, bake the pie in the lower third of the oven). To blind bake the crust, press parchment paper or aluminum foil tightly against the crust, covering the edges to prevent them from burning. Fill with pie weights/dried beans/uncooked rice. Bake crust for 15 minutes. Transfer crust to a wire rack and remove weights and foil. Bake crust for 5 minutes longer, then transfer to a wire rack. Pour the pumpkin filling into the warm pre-baked crust, filling until you come close to the edge of the crust (You might not need to use all the filling. You can bake the rest of the filling later in mini pans). Bake until the pie is puffed in the middle but still jiggles when you gently shake the pan, 50 to 60 minutes. When the crust edges start to brown too deeply, be sure to use a pie crust shield or aluminum foil to cover them. Transfer pie to a wire rack and let cool completely. Store pie in the refrigerator for up to 3 days. Serve at room temperature, with whipped cream if desired.